The maze of lanes between Diss and Thetford hides secretive villages. 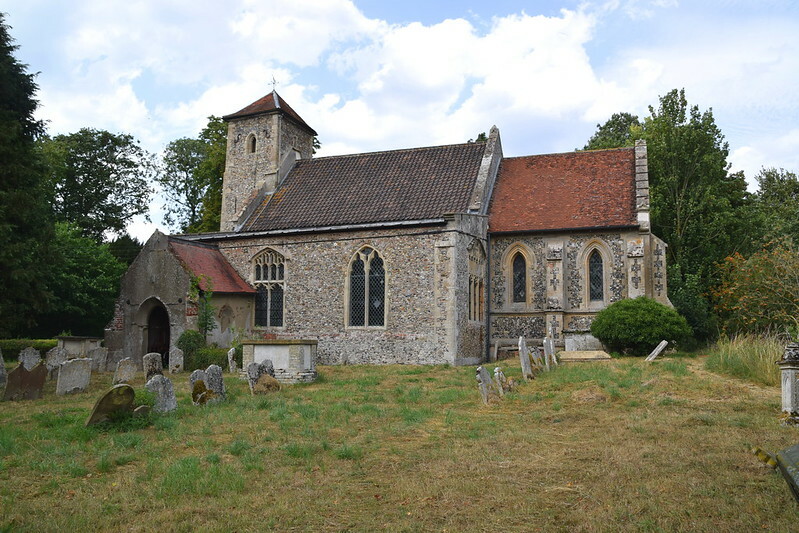 This part of south Norfolk can seem remote even today, so it is surprising that Fersfield holds an important place in the history of Norfolk parish churches, as we shall see. The church sits where the lanes come together, its truncated, pencil-like tower a beacon across the fields and farmlands. 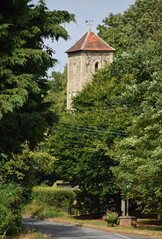 The capped tower is reminiscent of Culpho and Thornham Parva in Suffolk, and probably dates from the early 14th century. If so, it is probably later than the bulk of the church against which it sits. There were further improvements: money in the late 15th century brought a fairly imposing south aisle and porch, and the chancel is entirely Victorian, I think. But it all works well together, especially when seen from the south-east. 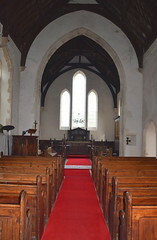 St Andrew was the home parish for much of his life of Francis Blomefield, author of the early 18th century <i>History of Norfolk</i>. Blomefield was one of the first of a generation of 18th century historians who recovered the past from the oblivion to which the 16th century Anglicans and 17th century Puritans had done so much to consign it. 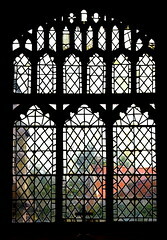 From the modern point of view, his most valuable work was a survey of the contents of the parish churches of the county. For some churches, this is just about the only record we have between late medieval wills and bequests on the one hand, and the passion for recording medieval features that arose under the Victorians on the other. Francis Blomefield was born in 1705, and later biographies record that he developed a fascination for visiting churches as a child. Ordained as an Anglican minister in 1729, he briefly became Rector of Hargham and then came to Fersfield, where he would spend the rest of his life. He was not always a well man, and although he visited many of the churches himself, the bulk of his work involved sending questionnaires to Rectors of other churches. Because of this, and because Blomefield himself did not always understand what he was seeing or reading about, the survey needs to be used with care. Moreover, Blomefield did not finish it. I always tend to think of 18th century antiquarians as bewhiskered old men sitting with quill pens at high desks, but Blomefield contracted smallpox and died at the age of 47. His work was completed by friends, most notably Charles Parkin and William Whittingham. I wonder how much Blomefield would recognise his own church if he came back to it today. The furnishings are all modern, and the feel is of a pleasantly light space of the late 19th and early 20th centuries. 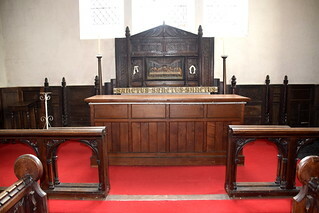 His memorial is in the rebuilt chancel, a fairly simple ledger stone set, not inappropriately, beneath the kind of 17th century panelling which must have been familiar to him. Less happy is the clumsy reredos, which looks as if some of the paneling had been left over and cobbled together with a picture of the Last Supper. Even today, St Andrew is not without Antiquarian interest. 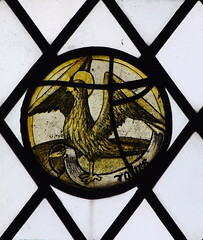 Above Blomefield's memorial in the east window are three roundels of glass, all of which are continental I think. 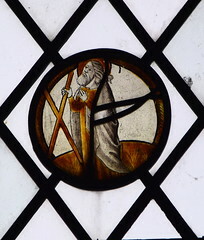 They depict St Andrew, St Gregory, and the eagle of St John. They were probably placed here by the Victorians at the time of the rebuilding. 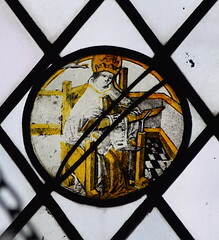 Curiously, Blomefield records quite a lot of medieval glass at Fersfield, mostly from the narrative of the Blessed Virgin, which is now all gone. The most famous medieval survival is Robert du Bois, the man in the glass case. 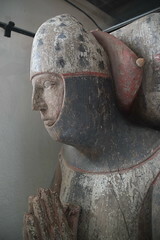 This painted wooden effigy sits in the south aisle. Du Bois died in 1311, and was probably responsible for the rebuilding of the tower. He lies with his legs uncrossed, a rather surprised buck at his feet. 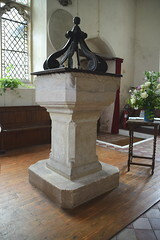 Nearby is a relatively plain Norman font. There is a strange stone effigy in an alcove up in the chancel, obviously reset by the Victorians. 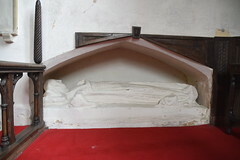 It appears to show a woman, although it may well be a recut image of a 13th century Priest. But despite the modern ambience, this is a church in which to recall the 18th century. 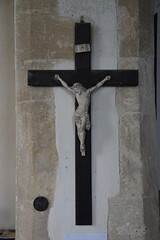 The south aisle contains more Blomefield memorials, curly ones on the walls and simple ledgers on the floor. 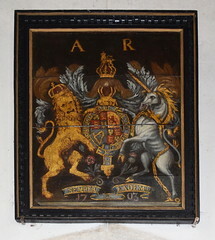 And, looking down on them all, the great royal arms of Queen Anne dated 1703, two years before Francis Blomefield was born.